Where the foothills of the Andes meet the vast Amazonian rainforest in eastern Ecuador there is a small town called Shell. It's a pockmarked, termite-eaten, one-street place which doubles as a missionary centre and a regional airstrip, but it was here in 1937 that the mighty Shell oil company based its crack Latin American oil-prospecting team. The prize was the vast deposits of crude oil believed then – and now known – to lie beneath some of the densest forests in the world. Nearly 75 years later, Shell the company has long left Shell the town and half of Ecuador's estimated nine billion barrels of oil reserves have been extracted. Ecuador has earned $130bn from the oil found so far in its forests and it earns 40% of its income from it. But Ecuador now faces a dilemma. 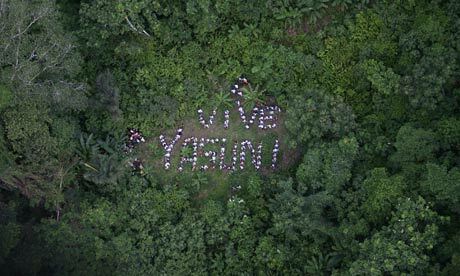 Five years ago the state oil company Petroecuador found a massive new oil field containing nearly a billion barrels of oil in Block 31 of the Yasuní national park close to the Brazilian border. The find was equivalent to 20% of all the nation's reserves, worth a minimum $7-10bn. I've said it many times and I'll say it again. As valuable as oil is, drilling for it shouldn't involve destroying pristine environment and risking the lives of locals. Governments should carefully consider these points before granting any permits. Usted hizo algunos puntos agradables allí. Miré en el Internet para el tema y encontré a la mayoría de los individuos irán junto con con tu blog.